Sarge has made a full recovery and wants to thank all of her well-wishers for your sweet words. She has taken back her position as Head Hen in the coop and is making sure everybody knows she's Sarge, large and in charge once more. 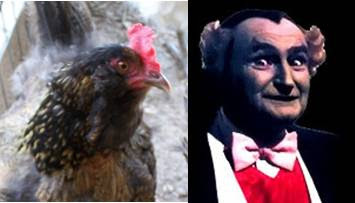 There is something I've always wondered, though.... am I the only one that sees the resemblance here? This weekend was full of activity up at the barn- it's undergoing an extreme makover right now! I'll be posting pictures of the changes we've made in upcoming posts, plus a peek at my new and improved potting shed from last year. And no bees as of yet- Dad says it may be the end of April before they arrive. I can't wait! GOOD MORNING PAULA, GLAD SARGE IS DOING WELL. CAN'T WAIT TO SEE YOUR MAKE-OVER AND I'M ANXIOUSLY AWAITING THOSE BEES! HOPE YOU HAVE A GOOD WEEK. Yay I am glad to hear Sarge has made a full recovery! Glad to hear that one of your favorite hens is doing better and up to her old antics! Paula, you are so funny! It never did cross my mind, but I guess there's something about the eyes that looks similar between the two photos, LOL! Oh I am so glad Sarge is feeling fine and back in charge. The pictures are cracking me up cause I DO see a resemblance! Hope you have a great day! Hooray for Sarge, and the resemblance is uncanny. Sarge is back in the henhouse; whooHoOo! I need your recipe you gave her... have had some get droopy like that and they were goners. shhh don't tell her I said that. Ya know... I'm sorry Farmchick... but I don't see the resemblance? Anxious to see the barn. AND can't wait for the bees! I mean I am so so so lookin forward to your bees! I really want to learn about them. They are all over my crab apple tree now, but it's supposed to FREEZE tonight. I pray they are WRONG WRONG WRONG. I forget who that dude is by sarge's picture but ... those eyes. And he needs some sun! Ahhh I just read someone's comment that it was Grampa off the Munsters. I think she looks more liiiiiiike.... ETHEL maybe? Have a great day Paula; have fun in the barn! Yea for Sarge! I've been waiting to hear an update and this is great news. If Sarge only knew how many people were thinking of her. I am so glad she's better! I do see the resemblance. You are so funny! Glad the old girl has rallied in time for spring chicken duties! Ooooh, a redo? We all love redos and are hopeful to see pics. Glad to see Sarge is doing better. She and my Snowball would have made a good team! can't wait to hear more about the bees and the makeover....always something to do, isn't there? WOOO! HOOOO! For Sarge! That's great news. Your post made me laugh from the "Sarge, large and in charge" to the picture of Eddie Munster's Grandpa (did he have a name other thatn Grandpa?). Can't wait till your bees arrive! Glad to hear that Sarge is recovered....I was wondering about her! I do see some resemblance there! How cute! I'm excited for you about the bees' impending arrival. I'll be following closely. I'm so jealous... a potting shed! I can't wait to see pictures of the barn. I'm glad Sarge is feeling better and able to claim her position back. How funny! Yes, they do resemble each other. A barn and a potting shed ! Wow. Will you be showing us pictures of the inside of the shed? Please? I am so glad Sarge has recovered! I worry so much when any of my animals are "under the weather"! I can't wait to hear more about your beekeeping! How exciting! So glad your hen is doing much better. Looking forward to seeing your extreme makeover pictures. So glad to hear that Sarge is well and back in charge. I think Sarge is much cuter than the picture. Yeah, Sarge is better.....love the comparison picture! Sarge I am glad you are back to your post. Miss Paula....I can't wait to hear about your adventures with bees!!! !